Spring Stadium Zone is the third level in Sonic 3D: Flickies' Island for the Sega Mega Drive and Sega Saturn, coming after Rusty Ruin and before Diamond Dust. As with other stages in this game, Spring Stadium consists of two standard Acts followed by a third Act containing only the boss fight. 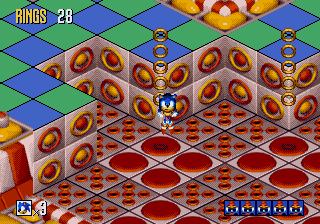 In Acts 1 and 2, Sonic must free captured Flickies from inside Badniks, depositing five of the birds into a Goal Ring to progress between sections of the level (usually three per Act). Spring Stadium fulfills the casino trope in the sense that the whole level is one big pinball machine, much like Sonic 2's Casino Night Zone. The boss of this level has Robotnik attacking you with diabolical hands attached to his new machine. Although the pinball flippers are absent, the feel of the Pinball Machine can be felt by steep hills, side bumpers, and round bumpers. Springs embedded in the floor can spring up and let you collect a few rings, however not every red spring on the floor will spring you up. Some obstacles not only include the pinball bumpers and springs but also balloons which can bring you up onto the next platform, much like those in Carnival Night Zone and the two-player stage Balloon Park Zone, both from Sonic the Hedgehog 3. There are also floor spikes which are not active until Sonic steps onto them. If he steps on them, he has to jump quickly before they spike up. There are also spikes along certain walls, a machine that sends out spiked missiles every so often, and in Act 2, tall spikes that pop out from holes in the ground when Sonic approaches them. Dragfly — A dragonfly-like robot. Releases a blue Flicky. Fish — A puffer fish robot. Releases a purple Flicky. Shell — A roaming crab-like robot. Releases a red Flicky. Spider — A yellow spider robot. Releases a green Flicky. This page was last edited on 5 October 2018, at 10:23.